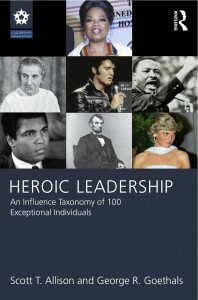 In Heroic Leadership, we review the relationship between leadership and heroism, showing how our most cherished heroes are also our most transforming leaders. We also describe in some detail a taxonomy, or conceptual framework, for differentiating among the many varieties of heroism. Moreover, the book profiles many different individual heroes and provides an analysis of their heroic contributions. — JAMES MacGREGOR BURNS, Pulitzer Prize winning Professor Emeritus at Williams College and Distinguished Leadership Scholar at the James MacGregor Burns Academy of Leadership of the School of Public Policy at the University of Maryland.